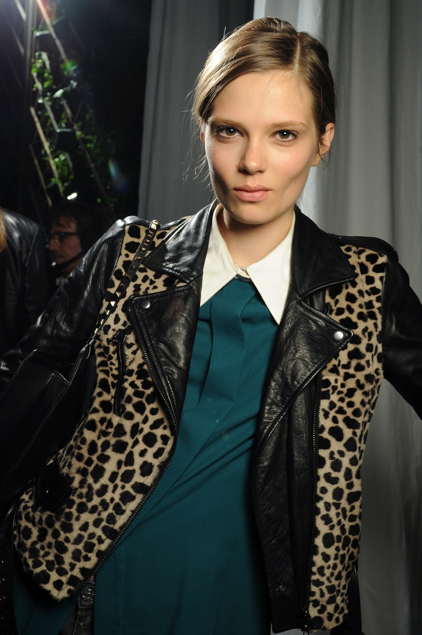 This leopard/leather/emerald combo is resonating highly with me. Caroline, whose career is currently exploding, seems to have the personal style to match her newly found success. oh my gosh. this is beautiful. with the lipstick it's unreal but she's such a natural beauty too. i love the jacket. Fantastic girl. The jacket is pure love and so is the girl. oh man oh man oh man i love her new look! Je l'adore ! Et le rouge à lèvres fluo lui va super bien, tout comme sa veste qui est super jolie ! where do you think i can find that shade of lipstick?? hmmm if i wear it will i look too much like a barbie? It's amazing!!! I just love the combo.